In Santa Fe, Georgia O’Keeffe (1887-1986) is front and center much of the time. There is a museum that bears her name here and it is one of the city’s most popular attractions. 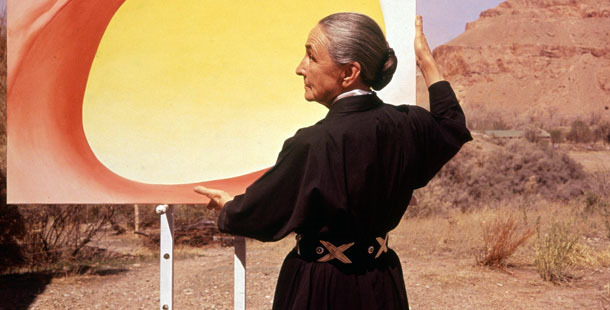 Georgia O’Keeffe began coming to New Mexico in 1929 and visited every year until 1949 when she decided to become a resident of the state. Last week I saw a wonderful exhibition called “Georgia O’Keeffe Abstraction” for the second time. 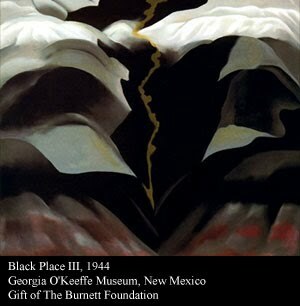 I first saw it in New York at the Whitney Museum and last week at the O’Keeffe here in Santa Fe. Between those two venues it was presented at the Phillips in Washington D.C. From opening to closing the show was on the road for a full year. The exhibition team was lead by Barbara Haskell, curator at the Whitney and included several other authorities including Barbara Buhler Lynes, the Emily Fisher Landau Director of the Georgia O’Keeffe Museum Research Center, also an eminent authority in the field. The exhibition traces the development of O’Keeffe’s interest in abstraction over her long career so that one can see her themes and interests in chronological order. The Whitney version included over 125 paintings, watercolors, drawings and sculptures. It was truly a monumental show befitting a great artist. For me, however, in exhibitions, less is often more, so I found the exhibition here in Santa Fe, where it had contracted by about 25%, more digestible and enjoyable. Since I am always interested in what makes people tick, why they go in the directions they choose, I particularly enjoyed O’Keeffe’s quotes on the walls between the works of art. One of my favorite, from 1922, “Singing has always seemed to me the most perfect means of expression… It is so spontaneous… Since I cannot sing I paint”. That jogged my memory, my father used to say something analogous, “Since I cannot create art, I deal in it”. Ah, but that is for another Missive! 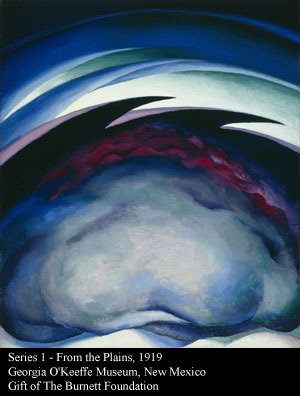 I was always a fan of Georgia O’Keeffe even when her monographic exhibition at the Metropolitan Museum in New York in the 1970’s was generally panned* But I only fully appreciated her work a decade later when I came to New Mexico and saw the light, the clouds, the mountains as she had. We all strive to communicate what is most important to us in any way we can. Some are masters of the spoken word, others of the pen or paint brush. For me O’Keefe is among the masters. Using abstraction she evoked the essence of the light and landscape of her (and my) beloved Southwest. Some pretty designs alright. Doing the painting yourselves is more fun but a good place for ideas for more design is this site of wahooart.com, that I use to help with my wall decorations. You can browse for a painting like this The tree, by 20th century Czech artist, Frantisek Kupka, for example, http://EN.WahooArt.com/A55A04/w.nsf/OPRA/BRUE-8LHUQV , that can be ordered on line and delivered to you.